Sure, road-tripping around Alberta is always awesome. But sometimes you just want to ditch the car and come at the experience with a different set of eyes. Here are five off-the-beaten-path ways to see the incredible sights along and around Alberta’s Cowboy Trail. It’s never been truer that it’s about the journey, not the destination. Whop, whop, whop. . . That’s the sound of a helicopter waiting to take you on an epic sight-seeing flight that will make your heart flutter. If you’re a thrill-seeker, be sure to call shotgun. 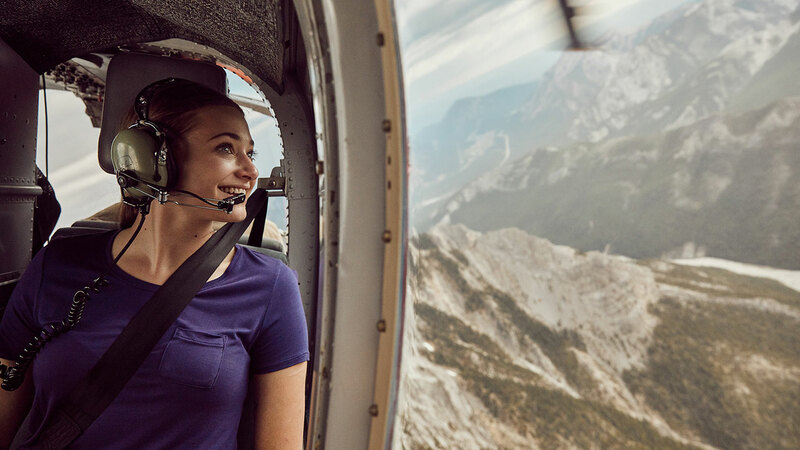 But really, there’s no bad seat in the house – as you step into Alpine Helicopters six-seat Bell 360. Your flight at 3,000 metres (10,000 feet) high is as bucket-list worthy as it comes. “It’s what people dream about forever and then they finally get to do it,” says pilot JF Hunter. From the air, the Bow Valley splays out before you in a 360-view that will have you swivelling in your seat. Once you grab a few shots, put your smartphone down and just sit back and enjoy the breathtaking vista. The magnificent sight of mountain peaks, glaciers, lakes and forests are worthy of your next screensaver or Instagram post and will have you grinning until your cheeks ache. While you’re winging over the peaks that reach as high as 3,600 metres (12,000 feet), your pilot will point out such landmarks as: Victoria and Athabasca glaciers, mind-blowing Marvel Lake and sheer peaks carved out dozens of millennia ago during the last Ice Age. This is a thrill that will take a while to come down from. Most locals may not know that Southern Alberta has its very own Route 66. But when you hitch a ride with local mountain biking guide Jeff Woodgate, or his wife Laura Mislan, you’ll get some serious intel on all the best mountain biking trails veering off this little stretch of highway which leads west of Bragg Creek. Woodgate and Mislan are more than pumped to help spicy or unseasoned mountain bike riders suss out some brag-worthy trails. Their company, Alberta 66 Mountain Biking, offers all-inclusive half-day, all-day custom guided tours. And for those who want to do a really deep dive, they offer multi-week tours and clinics. Woodgate and his “star employee” – Oscar the Van – do all the heavy lifting. Woodgate rents the bikes, picks you up and shuttles you to the staging area for a day of exhilarating riding with the Rockies always in view. 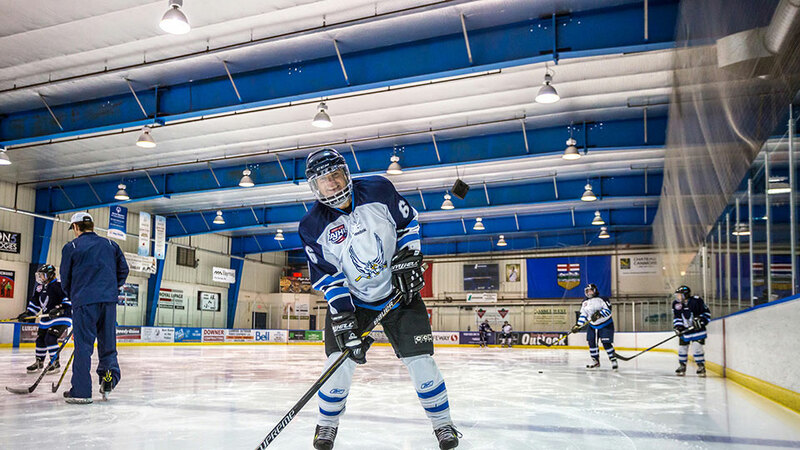 Their playground of choice is the gorgeous forested and mountain-ringed West Bragg recreation area just 45 minutes south and west of Calgary. If you want to stay close to the city, they can do that, too. You can strike out on your own with a bike delivered to your front door, but it’s always more fun to ride with a local who knows the ropes. That economy seat in the Boeing 737 you’re probably used to travelling in – with semi-comfy seats, a pull-down tray and a screen to watch your favourite Netflix series – will seem ultra luxe once you scope out the vintage airplane museum in Nanton. The world of aviation has come a long way, baby. It’s officially known as the Bomber Command Museum for a reason: its two-hangars are filled with retro flying machines from the Second World War. You don’t have to be a history aficionado to appreciate the collection of wings here. The massive main attraction is the Lancaster Bomber, with a wingspan about the size of that 737 you know well. But climb inside (helmet required) to get a feel for what it was like to ride in one of these beasts that plied the skies during the Second World War. It's a hands-on introduction to an evolving era in aviation that will have you respecting the pilots at the helm of these flying machines. Way before there were cars and trucks on the Cowboy Trail, there cowboys in the saddle riding over the rolling foothills. Your transportation into the past at the Bar U Ranch comes courtesy of two adorable shiny black Percheron horses pulling you in a wooden cart. It’s not just the gentle clip-clop of the horses leading you down the trail that will have you romancing the past, but the picturesque setting as well. Weathered clapboard buildings dot the property – the blacksmith shop, cookhouse and, further down the lane, the saddle barn. That mound you see in the field was actually the refrigerator of the day, where food was stored underground to keep cool. In the distance are mountain peaks, and to complete the pretty picture, a stream runs through the property. Bar U Ranch, a national historic site established in 1881, was not only one of the longest running ranches in Alberta, but it was also known for breeding Percherons. They are one of the hardest working horses that tilled the soil before we had machinery to do the heavy lifting. And before you hitch your ride back to the entrance, be sure to stop by for some cowboy coffee, a bit of cowboy poetry and tales from the ranch while sitting around a campfire.